Calmbirth strives to be leaders in cultural change by empowering and enabling birthing couples to experience birth as a natural part of life with confidence and fearlessness. Our vision is to change our current birth culture to one that is talked about and experienced far more positively, now and for future generations. Want to become a Calmbirth Educator? As Calmbirth Educators our job is to be: informative, dedicated, supportive, nurturing, inclusive and passionate about helping future generations birth calmly, confidently and fearlessly, by promoting positive change in birth by helping couples create positive birth experiences. Are you a caregiver or allied health professional? The Psychology of Birth Calmbirth® workshop for caregivers and allied health professionals aims to provide midwives, medical staff and allied health with a holistic and scientifically proven approach to maternity care. At Calmbirth we are passionate about collaborating with like minded organisations who share the same values and vision as us. In supporting pregnant couples and improving birth outcomes for families in Australia and abroad, on both a physical and emotional level and changing our birth culture to one that is talked about and experienced far more positively now and for future generations. Peter, the founder and gifted architect behind our incredible Calmbirth program, was the first pioneer in childbirth eduction to bring this model of childbirth education to Australia in the late 1990s, and at the time revolutionising childbirth education in Australia. The Calmbirth Program evolved out of this work commencing in 2004 and has grown to be the highly credible, professional and quality childbirth education program that it is today. 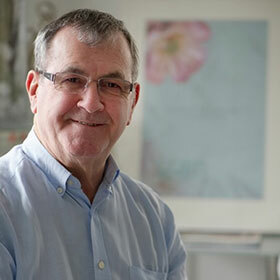 Peter, a midwife for over 40 years, with extensive experience in mental health early on in his career, has been internationally recognised for his success in changing and improving childbirth education in Australia and overseas. He has a passion for mind-body medicine and has been a practitioner in this field for over 20 years. He has an extensive knowledge and understanding of the mind and its impact on our perceptions in life and on our physical health and wellbeing. Peter’s background in this therapeutic medicine means he understands the connection and power between a woman’s emotional state and they way her body responds in birth. Peter believes that preparation is the precursor to the experience. He developed the Calmbirth Program to assist couples prepare for birth confidently with evidenced based knowledge and tools.